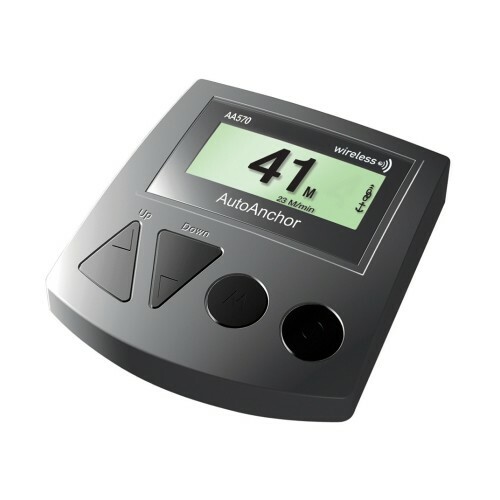 The latest Auto Anchor rope and chain counter, the AA570, integrates functionality, with the installation advantages of wireless technology. The AutoAnchor AA570 is a panel-mounted counter that operates the anchor winch and counts at the same time. The break through is its ability to connect to a base station in the anchor locker, over 10m (33 ft.) away, without running cables through the boat. It can also control and count 2 separate winches through the same head unit, and is compatible with the increasingly popular drum style winch. Easier installation – no cables to run through boat. Please note product specifications may change without notice and the latest product specification may not be reflacter in the version available on this website. Please contact AutoAnchor for specific technical information.